Only a day after Rafael Nadal was beaten in shocking fashion by Lukas Rosol, Roger Federer survived a scare of his own, fighting back from two sets down to overcome Julien Benneteau to advance to the 4th round. From the beginning, it was clear that Roger was feeling the nerves and the pressure of the moment - Nadal had just been eliminated less than 24 hours later, and while that would bring Fed some relief, in the end, it did not. Add that to the roof being on to start and Benneteau playing some inspired tennis, and Roger quickly got into trouble. After dropping the first set 6-4, Roger broke early in the 2nd, only to get broken back. They held serve until the tiebreak, and just before that at 4-5, Roger had 3 set points but could not convert on one, with some sensational play by the Frenchman. Roger lost his serve on the first point of the breaker and from there it was all downhill as he lost it seven points to three. Right from the start of the 3rd set, the tide turned. Roger got an early break, and Benneteau slipped on the grass while approaching the net, which seemed to stun him. The Fed took the set 6-2 rather easily, but there was still more hard work to be done. 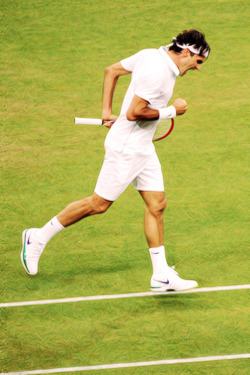 Will you EVER see Roger more pumped? In the 5th, Roger got the break right away at 2-1 with a scintillating (love that word!) forehand return winner. Benneteau started to cramp and had to see the trainer. He was a little bit slower, and that is all the advantage Roger needed to capitalize. He consolidated the break to go up 3-1, and from there he did not look back. He broke again and served out the match in fine fashion to win 46 67(3) 62 76(6) 61 in nearly four hours of spectacular tennis. Quite simply put, Roger was under immense pressure and he fought like the true champion that he is. Just think about what he was facing: losing before the quarters for the first time since the French Open in 2004; losing the chance to win the Wimbledon title that he has openly stated he wants more than anything (and with it, the #1 ranking). To have all that kind of pressure on you and be within two points of losing that one chance 5 TIMES shows what kind of heart he displays. Roger Federer, without a shadow of a doubt, now more than ever, shows why he is the greatest tennis player ever and why he is a critically underrated fighter. Full credit must be given to Benneteau, as he played the best match of his life. In the end however, Roger broke him down physically, which was smart to do as Julien had had very little match play in the past few months compared to other pros with the wrist injury he suffered. For being 30 years old and suffering numerous injuries he has had lately, what he did was inspirational. For Roger, he looked very relieved to have gotten through. He next plays Xavier Malisse of Belgium, a 31 year-old from Roger's generation. He took out Fernando Verdasco in 5 sets, but like Roger, he will have the weekend to rest. I see Fed getting back to his dominance in that one (as he usually does after gutsy wins), although I still expect at least one or two very close sets (Xavier is a decent grass player). All the best, and I am so happy to see Roger still alive in this tournament. I was screaming and yelling like a complete madman during that fourth set tiebreak, and I am so proud of Roger for fighting through that tremendous challenge with such poise and determination, like only a champion like him can. PS - I am not looking past Malisse, not after this scare. With Rosol's upset over Rafa, it seems as if other players are gaining belief that they previously did not have. The rest of the matches for all the top guys could very well prove to be challenges if these underdogs find inspiration to play exceptional tennis for long stretches of time.